Three main engines running on liquid hydrogen/liquid oxygen propellant, rated at 512,950 lb thrust each; two solid, reusable rocket boosters rated at 3,300,000 lb each at launch, running on aluminum powder, iron oxide, and ammonium perchlorate powder. 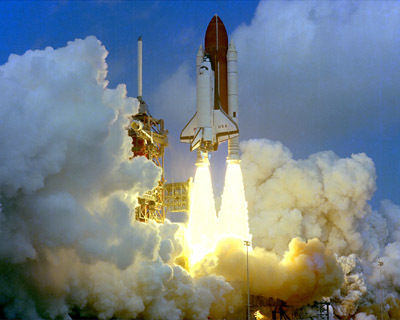 Shuttle Columbia was the first shuttle to fly, and flew the first five shuttle missions. Shuttle Columbia was the first shuttle used to deploy a commercial satellite.